Barely a week into the new year and the young men of USA Hockey have stunned the competition and silenced Canadian spectators by winning gold twice in two days. The U.S. National Under-17 team traveled to Ontario to participate in the 2010 International Ice Hockey Federation Under-17 Hockey Challenge. In a Canadian-stacked competition, the Americans came away unscathed with a 6-0-0 record after bouts with three separate Canadian teams -- Atlantic, Pacific and Ontario -- as well as The Czech Republic, Russia and Sweden. "I couldn't be happier for the 22 players in the room," said Ron Rolston, head coach of Team USA. "They went through a lot of adversity to not only win the tournament, but to win every game. This might be one of the toughest international events to win and the players competed hard throughout. I think this is the strongest field I've seen in the three years I've coached at this tournament, so it shows the heart and character of our players." 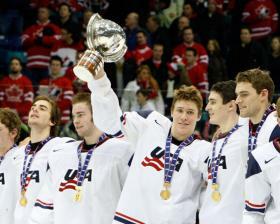 The United States solidified its dominance in the tournament, beating Canada-Ontario 2-1 to win the gold medal. 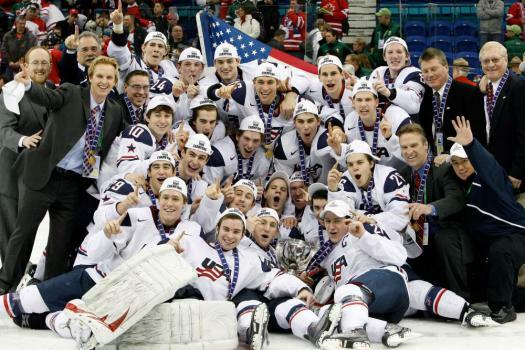 This is the first gold for Team USA's Under-17 team since 2002 and third overall. The U.S. momentum wasn't limited to the tournament in Ontario. The U.S. National Junior Team was able to silence a rousing Canadian crowd and crush Hockey Canada's hopes for a sixth-straight gold medal in the IIHF World Junior Championships. Each with 3-0-0 records going into a their first meeting on New Year's Eve, Team USA and Canada gave the fans a game to remember. Evenly matched and tied at four, the teams were forced into a shootout that eventually pronounced Canada the winner. But with wins against Finland and Sweden the Americans found themselves in the gold-medal game facing Canada yet again. 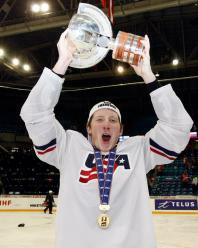 The win marked the United States' first gold medal since the 2004 win against Canada in Helsinki, Finland, and the sixth overall medal since 1977. "We put the right team together for this tournament, filled with gritty, hard-working players," said Dean Blais, head coach of the U.S. National Junior Team. "Our guys battled the whole tournament, and we're very happy to come away with the gold here in Saskatoon." Could these two golden wins on Canadian soil be a foreshadowing of what's to come in the 2010 Olympic Winter Games in Vancouver?